Paige Patterson has announced that one of the 70 stained glass windows to be installed in the new J.W. MacGorman Chapel at Southwestern Baptist Theological Seminary will feature the "old recalcitrant fleabag", FBC Jax Watchdog. 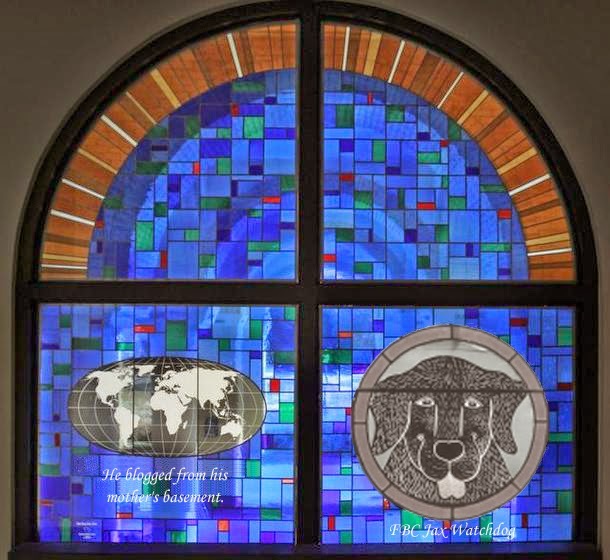 The window will feature a round, forward-facing, medallion-style inscription of the Watchdog with a slightly protruding tongue to represent his tireless efforts in blogging about important matters in the SBC and modern evangelicalism. The inscription on the window will read "He blogged from his mother's basement", with a beautiful oval globe to represent the Watchdog's world-wide outreach and to honor how God can use even a seemingly insignificant blogger to spread the truth to so many who need to hear it - all over the world. The inscription of "He blogged from his mother's basement" is a reference to Ergun Caner and others who have unfairly criticized bloggers as being "frustrated people blogging from their mother's basements." Some have even accused bloggers of writing blogs in their underwear, which the Watchdog has vehemently denied since as he says "..dogs don't generally wear undergarments." Already there have been nine of the windows installed in the chapel, including W.A. Criswell baptizing a man in the Jordan River while wearing a well-pressed blazer and tie, O.S. Hawkins and his wife, Rick Warren (shown at right), Charles Stanley, Andy and Joan Horner, and Huber Drumright, Jr.
SWBTS student reaction to the announcement of the new FBC Jax Watchdog window was mixed. One student said that no troublemaker like the Watchdog should be inscribed in stained glass - while another student - who wished to remain anonymous - said "Well, I guess if they're going to give a window to Andy Horner and Huber Drumright and Dottie Riley - none of whom I've ever heard of - why not the FBC Jax Watchdog for all he has done to hold misbehaving churches and pastors accountable in the 21st century?" When asked why the Watchdog would be given such an honor, Patterson said he respects the Watchdog's blogging efforts and his tenacity to endure trials and hardships and efforts to "shut him down", even though he said with a hearty chuckle, "The old fleabag recalcitrant has busted my chops a few times over the past 7 years." Watchdog first wrote about Paige Patterson in 2007 when Patterson called Watchdog and others at his home church "recalcitrants" in the old SWBTS chapel for attacking the "man of God". Watchdog also wrote in 2008 about the Sheri Klouda firing at SWBTS and some of the public statements made by prominent SBC preachers. The exact location of the FBC Jax Watchdog window within the chapel is yet to be determined. Patterson said it will likely be in the Ergun Mehmet Giovanni Caner Center for Truth in Debating, or perhaps in the window above the last stall in the men's bathroom on the 2nd floor. I don't know if this is true or not, but I don't believe it. Wait...I can't PROVE that its NOT true, therefore it must be true. And this would be a miracle if it is true. And since I believe God created the earth, then it would be inconsistent for me NOT to believe he COULD and DID do this for the Watchdog. Also, I believe all of the articles Watchdog writes, or none of them. I can't pick and choose which ones I want to believe. So I believe this post too. I love being a logical Christian believer! Congratulations Watchdog. God has truly blessed you. I can't wait to hear you speak at chapel this upcoming year. Amen. It was just announced that two new windows have been added to the plans. The Steve Gaines honorary window will feature a depiction of the portly pastor with one of his large hands pressing on the shoulder of an unidentified former staff member, his corresponding eye "loving on" him, while he glares menacingly at an unidentified ex-communicated church member with the other eye and points angrily towards the door with his other hand. The inscription will read, "He navigated uncharted waters," along with the bible verse Deuteronomy 13:13... "... troublemakers have arisen among you and have led the people of their town astray." The subject of the second window, Mac Brunson, with his helpmeet Honey beside him, will be depicted on the deck of a luxury ship cruising down the Danube River with his mouth open wide. The accompanying caption will read simply, "Ha!" Wow, what an honor. You the dawg! Woof, woof! Congrats, dawg. It's about time your work was acknowledged in the halls of power. I look at these guys that they are putting windows up for in the SWBTS......I am sure T.B. Matson is spinning in his grave. "I don't know if this is true or not, but I don't believe it. Wait...I can't PROVE that its NOT true, therefore it must be true. And this would be a miracle if it is true. And since I believe God created the earth, then it would be inconsistent for me NOT to believe he COULD and DID do this for the Watchdog." TROLL - are bringing up an issue that you stated twice earlier that you didn't want to discuss and would not discuss again? Perhaps they will include a giant TROLL depiction in Ergun Caner stained glass window. That would be appropriate considering your less than honest statements in the past. Does Jesus get a window? That is so good. I almost believed it. Not! Thanks for the laugh. I believe Anon 8:22's comment was parody. Very nice parody, too! I believe Dr. Maston knew it was coming. He understood power and its use. He also understood it's abuse. Somehow, I hear him saying, " I told you." Perhaps no one put those images in the stained glass windows. Perhaps they just appeared miraculously like those images of Jesus and Mary that show up on the side of buildings or in a slice of toast. Question: Is the Dog Catholic? It is good to have the Troll Police reading every comment. That way, we get a line by line analysis and side conversation between the Troll and the Troll Police. NOT! Anyway, is Ergun Caner's decade of deceit for profit the same as an anonymous poster contradicting himself on a blog? I guess it is for some trolls. I would have thought the late Adrian Rogers (the subject of one of the "real" windows) would be, too, but apparently his family went along with it. I think if I were his widow I would have said, "Thank you, but please... don't. Adrian would never approve of this." Off topic a bit, but I've discovered that you don't have to reproduce the Captcha letters or numbers exactly for your comments to go through. A lot of them, especially the letters, are difficult to read, so if you come anywhere close (reversing numbers, etc.) it will usually go through. Funny, Dawg, but one important observation: Huber Drumwright was a legendary Professor of New Testament at Southwestern...a true scholar and a fine teacher from the old school. He doesn't belong in your target list. Huber Drumwright was a legendary Professor of New Testament at Southwestern...a true scholar and a fine teacher from the old school. He doesn't belong in your target list. Number one, the man wasn't on anyone's "target list." And number two, that may very well be true (I've never heard of the man), but he doesn't belong in a stained glass window in a chapel either. Indeed, that guy wasn't a "target" - just poking some April fool's fun at the fact he is a guy that most people reading this blog have never heard of. He's probably more disturbed that a cheezy cartoon figure of himself is being put onto a stained glass windown, than being parodied on a blog making fun of the same. 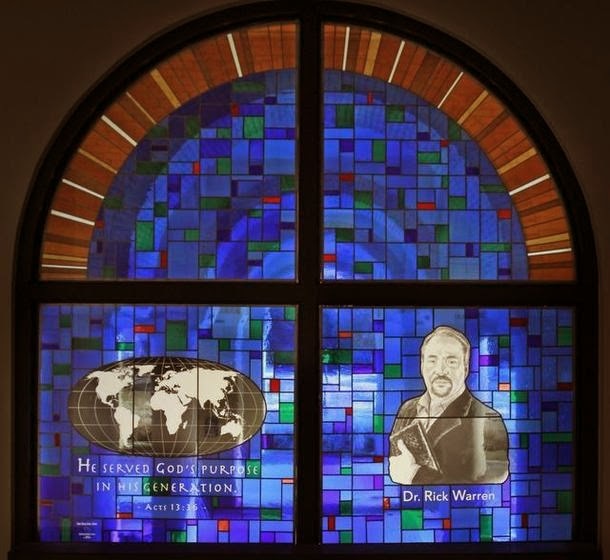 Whats sad is the stained glass of leaders of the recent "conservative" movement is not a fools joke. Dr. Drumwright, T.B. Maston, Dr. Jack McGorman, (His friends called him Cactus Jack. A great person. A fantastic teacher.) None of these SWBTS professors would go for this corny legend in glass routine. Dr. Robert Naylor, President of SWBTS could say more in three sentences of a sermon than most could get out in an hour. He was long on faith and short on pandering piety. All Patterson is doing is following the lead of his mentor, W.A. -- let's-make-a-bronze-bust-of-me-before--I'm--gone Criswell. Patterson has no psychological choice. He and Judge Pressler, both leftover pawns from a lame and long lost pathetic game of build-a-theocracy-and we will run it, can only turn to the past, and through the medium of chilly glass, attempt to redeem their cold and lifeless ways by associating with those who were great---because they spent zero time trying to be great. William Hendricks taught living theology. Nothing on the order of these tiresome systems that bear more of a resemblance to religious erector sets than words pointing to the Word. Clyde Fant and William Pinson did more for preaching through their "Twenty Centuries of Great Preaching" than all the communication techniques and pastoral focus groups ever could. The current crop of Religious CEO's and Celestial Celebrities are laughable. Poor Ole Caner routinely voids himself of respect. A College President departs chapel and dives headlong into the BPC bathtub size swimming pool. That is not a risk. That is a sophomore fraternity stunt. Had he done a cannonball, he would have downgraded himself to a junior high school kid at the local pool. Obviously, he does have his standards. There will come a day when his authority is challenged. When he reaches for it, he will discover he traded it away, not for a bowl of pottage, but for laughs, giggles and grins. That will be the day his hard rain comes. You got it right Boss man, SWBTS professors circa 1972 missed the self-serving possibilities of becoming legends in their own minds. May the good Lord grant us one more tribe of their kind. Reminded of Petra's song, looking through Rose Colored Stained Glass Windows when I think of these windows. I would have thought the late Adrian Rogers (the subject of one of the "real" windows) would be, too, but apparently his family went along with it. As did the still-living Charles Stanley. Way to cool. Let's see if little brother can match the senior Caner. Georgia Baptists are in for a fun ride when the competetion between north and south Georgia Baptist schools heats up. Yeah, that's way to (sic) cool.